2 Level 4 monsters. This card gains 300 ATK for each Xyz Material attached to this card. Once per turn: You can detach 1 Xyz Material from this card to target 1 face-up monster you control; change it ..
You can Special Summon this card (from your hand) by Tributing 2 monsters with 2000 or more ATK. During either player's Battle Step, when this card battles an opponent's monster: You can banish that m..
You can Normal Summon or Set this card without Tributing, but its original ATK becomes 1900. You can Tribute 3 monsters to Tribute Summon this card. If you do: Destroy all cards your opponent controls.. While face-up on the field, this card is also WIND-Attribute. You can banish 1 DARK monster and 1 WIND monster from your Graveyard; Special Summon this card from your hand. You can rbanish 1 DARK mon.. When this card destroys a monster by battle and sends it to the Graveyard: Inflict damage to your opponent equal to the Level of the destroyed monster in the Graveyard x 100. You can banish this card .. Reveal the top 3 cards of your Deck, add 1 of them to your hand, then shuffle the rest back into your Deck. You can only activate 1 "Pot of Duality" per turn. You cannot Special Summon a monster(s) du..
You can Special Summon this card (from your hand) by Tributing 1 "Airknight Parshath" you control. If this card attacks a Defense Position monster,inflict piercing Battle Damage to your opponent. When..
1 "Elemental HERO" monster + 1 EARTH Monster. Must be Fusion Summoned and cannot be Special Summoned by other ways. When this card is Fusion Summoned: Target 1 face-up monster your opponent controls; .. Cannot be Normal Summoned or Set. 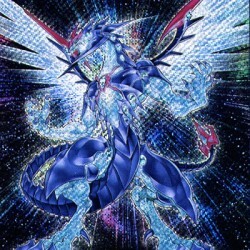 Must be Special Summoned (from your hand) by banishing 1 "Stardust Dragon" from your Extra Deck, and cannot be Special Summoned by other ways. There can only be 1 fac.. When a monster would be Summoned, OR when a Spell Card, Trap Card, or Effect Monster's effect that is activated that includes an effect that Special Summons a monster(s): Pay 2000 Life Points; negate ..
Before damage calculation, when this card attacks a Defense Position monster: Shuffle that monster into the Deck. During each of your End Phases: Send the top 3 cards of your Deck to the Graveyard. Yo.. Cannot be Special Summoned. You can Tribute Summon this card by Tributing 1 monster. This card gains the original ATK and DEF of the monster(s) Tributed for its Tribute Summon. When this card is Tribu..